Summer dancing will begin on Monday May 28th and last through until August 20th. 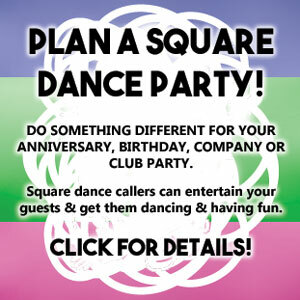 Each dance will be from 7:00 – 9:30pm but there are two locations we’ll be using. Most dances will be at St. Anne’s Parish Hall – 859 Barnardo Ave – and one will be at George Street United Church – Corner of George and McDonnel Streets. There will be seven summer dances to keep your skills sharp and the dancing will be basic and mainstream levels. Our callers will be Wayne Whatman and Joe Uebelacker and the cost will be $5.00 per person. For more information please call Sandy at 705-741-2582 or view our flyer!